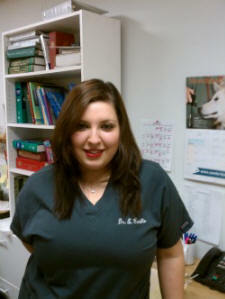 In the photo, Dr. Erika Carrillo in her office at Center-Sinai Animal Hospital. Dr. Carrillo’s enthusiasm for becoming a veterinarian began when she started volunteering at a veterinary hospital for her senior project in high school. She began as a kennel attendant, moved up to receptionist, and eventually to veterinary technician. Continuing to work these areas of veterinary medicine helped Dr. Carrillo pay for her undergraduate and graduate school education. She obtained a Bachelor of Science degree in Biology from the University of La Verne in La Verne, CA., then went on to earn her Doctor of Veterinary Medicine degree from the Veterinary School at Western University of Health Sciences in Pomona, CA. Medicine and surgery have always been Dr. Carrillo’s major interest and forte. “The mystery of having to figure out what is the problem without the patient being able to tell me directly is a very gratifying experience,” she says. When Dr. Carrillo isn’t busy practicing veterinary medicine at CSAH, she loves to spend time with family, friends, and her pets, Daisy and Nikky, who are the best pit bulls in the world! 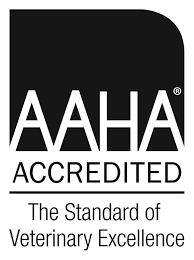 READ THE PET DENTAL CARE ARTICLE BY DR. CARRILLO: Dr. Carrillo writes about why pets need dental care, the importance of dental care for senior pets, gum disease and prevention, and other aspects of pet dental care to keep your furry friends healthy and smiling prettily.